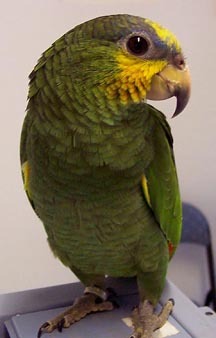 In January, 11 parrots came to us from the Manhattan Kansas animal shelter. They had been confiscated from a hoarding situation, where they lived in a cramped, filthy, dark space. The animal control officers couldn't even find all the birds on the first visit and had to go back a second day when there was daylight and some of the trash had been moved out of the way. This was our first collaboration of 2015 with four other rescue groups we have worked with in the past when there were too many birds for any one organization to handle. The parrots were divided up between our shelter and Beak 'N' Wings here in the Kansas City area, Nebraska Parrot Rescue, Iowa Parrot Rescue, and A Parrot's Perch Rescue near Springfield MO. This isn't one of our typical bird rescue stories, but it is related to birds. During a house call to work on a couple of parrots, the owners asked if we knew anyone who wanted two Guinea Pigs. After seeing the poor conditions that the birds lived in, we didn't hesitate to take in these adorable fuzzballs! We provided them a temporary home that was at least four times larger than the tiny cage they inhabited. They got fresh veggies, fruit, hay, and Guinea Pig pellets every day. They had a box to hide in and wood to chew on. They were sweet angels and we were kind of sorry to see them get adopted because they were fun to have around! We wish the owners had let us take the parrots too so we could have given them a better life. Peachie the cockatiel came in to our veterinary hospital as a patient with one of the worst cases of ruptured air sacs that we had ever seen. Somewhere inside her is an opening in one of the balloon-like air sacs, part of a bird's unique respiratory system, and the air leaks under her skin and gets trapped there. When she didn't respond to initial treatments, the owner could not afford to pay for lab testing and surgery, so Peachie was signed over to our Rescue program. We have tried for months to cure her so she doesn't look like a cockatiel that is about to explode, but everything we do results in only temporary improvement. We hope to find her a home where the owner can poke a little hole in her skin a couple of times a week to keep her comfortable. In 2015 we helped four different species of native wild birds, like this owl, that were later transferred to licensed wildlife rehabilitation facilities, either Lakeside Nature Center on the Missouri side, or Operation WildLife on the Kansas side. Another twelve wild birds, including sparrows, starlings, and grackles, were turned away by wildlife facilities because they are non-native species. Fortunately one of our employees, Aubrey, loves caring for these unwanted wild birds, and she takes them home to raise and release them, or she gives them a permanent home if they can't survive in the wild. This year we helped 16 domestic breed ducks and geese escape death after they were abandoned in area ponds. Two babies were going to be dumped, but the owner wisely chose to research the needs of these birds rather than follow the advice she had been given at a farm supply store to leave them to fend for themselves. These stores claim that they carefully screen and educate buyers, but we have testimony from several people who bought birds as gifts for kids at Easter, and were told to get rid of them when they were tired of the mess by leaving them in a pond or stream. The vast majority of these birds will die when ponds freeze in the winter if they even survive that long. Babies like this one without mothers to teach them how to be safe stand no chance against the hawks, dogs, and coyotes who want to eat them. Please spread the word that nobody should buy baby ducks, chicks, or rabbits as Easter gifts unless they have done their research and are prepared to offer a safe home to those animals for life. A woman called us saying she could no longer keep up with the eleven birds she owned, and she wanted to place a few of them in our adoption program. When we arrived, we found the birds were living in a tiny, windowless room in the basement, and the light was turned off in the middle of the day. Even when the single light bulb was switched on, it was very difficult to see some of the birds because it was so dark in their corner of the room. For instance, there are actually two African Greys in this cage, but we could only see one of them, even with the camera flash, since the other was hiding in the back corner in total darkness. The owner allowed us to take two cockatiels and five conures, but refused to surrender the other four birds, including the African Greys. We hope that she followed our instructions and at least moved the birds under the light, and leaves the light on for 12 to 14 hours a day. It probably won't be long before the remaining four birds will be coming to us since we were careful to be very polite and nice and we offered to help with the birds at any time. A parrot breeder with over 250 birds decided to start relinquishing some of their unpaired birds to rescue groups. Dr. Burge led a coalition of six organizations who took in the first round of 18 birds. Most of them were macaws and cockatoos that were tame, and had been given to the breeder by owners who no longer wanted them. We took in this sweet bird, who has been named Fannie by one of our generous donors who bid on the chance to name her. Fannie has a paralyzed right foot, her right wing won't extend fully, she plucks her feathers, and she had an infection. We aren't sure yet if she will be up for adoption or if she will stay in our new Sanctuary Room as a permanent resident. This bird's photo got a bigger reaction on Facebook than any other post we published this year. This is a pheasant that was found wandering loose in Merriam KS that was taken to the Great Plains SPCA. Since they knew we were better equipped to handle the bird, she was transferred to our Wild Bird Room. 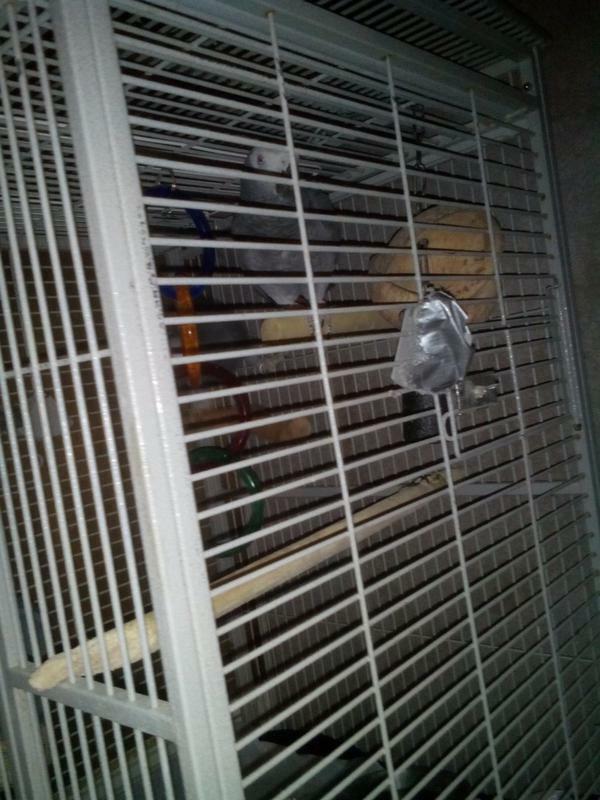 We work with a lot of the shelters in the area when they have birds come in and nowhere to house them. So what the heck is this thing on her face? We had to do some research ourselves. 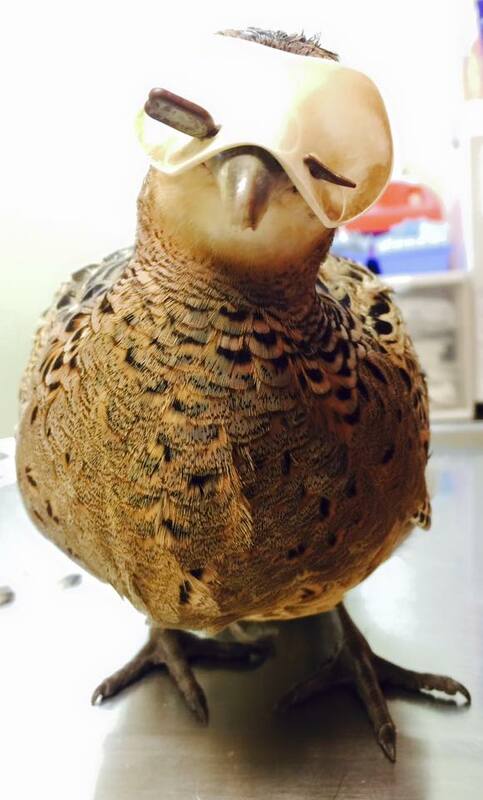 The plastic blinders she is wearing are held on her face by a rod inserted through the nostrils, which are located on the sides of the beak in pheasants. Depending on the species, they may or may not have a septum (divider) in between the nostrils that has to be pierced by this rod. The blinders keep her from being able to attack, injure, or kill other birds in her pen by blocking her forward vision, so she can only see above and below the plastic. These blinders are apparently commonly used on quail, roosters, and turkeys raised in overcrowded, tiny cages. After we removed the blinders and gave her a couple of weeks to readjust, she was adopted to a farm home with a giant flight cage where she is living happily with other pheasants. Those birds don't attack each other because they have adequate space to spread out and feel safe. A few weeks later, as Dr. Burge was driving down the highway, she spotted this truck. It was hard to tell what was in those boxes, but she was sure it was some kind of animal. She grabbed her cell phone and shot a couple of quick photos, and only after enlarging the photos on the computer did it become clear what was going on. 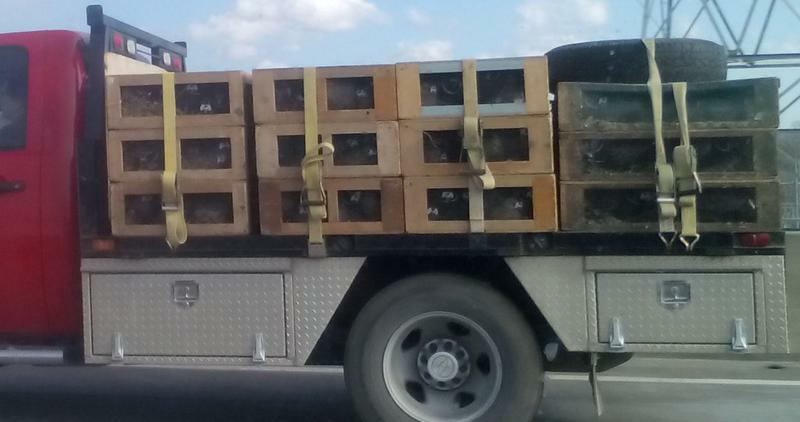 The truck was loaded with dozens and dozens of pheasants wearing those same blinders. The temperature that day was in the 40's, and the wind chill must have been awful for those poor birds while the truck sped down the highway. While these devices are illegal in Europe, they are still legal in the United States. The most exciting big event that happened this year for Burge Bird Rescue was the building of our new Sanctuary Room. The first photo was taken October 4, 2015, when the first loads of dirt were delivered to create a level spot for building in the back yard behind our hospital. We were able to raise a lot of the construction costs thanks to generous grants from a veterinarian we have worked with on disaster response, a car dealership, and other sources who donated after our friends voted for us online. Individual donors helped us out the most, either through direct contributions, buying items we had for sale in our office or on Facebook, or by sponsoring a bird. We needed this room to house 45 retired breeding birds, mostly Conures and Amazons, that are not tame and need to live their lives with minimal human intervention. Other birds that come into our rescue program that have special needs and may be hard to adopt may also end up living in the Sanctuary Room. There will be three outdoor flight cages for use in nice weather, two for the larger birds and one for the smaller birds. The room is designed to be hosed down, with a floor that slopes to a drain. The second photo shows the room only half filled after the grand opening on December 20, 2015. More of the birds will be moved in over the coming weeks.